Aerial mapping company Nearmap has flown and captured aerial imagery in the areas in North and South Carolina impacted by Hurricane Florence. The imagery is already supporting the extensive cleanup and reconstruction efforts for public safety, utility companies, insurance agencies and numerous contractors in many industries. High-resolution captures from the Wilmington and Myrtle Beach areas are now online and available for immediate use with more areas scheduled to come online over the next several days. The post-hurricane coverage includes about 4,530 square kilometers around the coastline from Newport, N.C., to Myrtle Beach, S.C., covering a population of about 752,000 people. All pre- and post-hurricane imagery can be accessed through a standard web browser using Nearmap’s MapBrowser, through Nearmap partners or via APIs to integrate with common GIS, CAD and other applications. 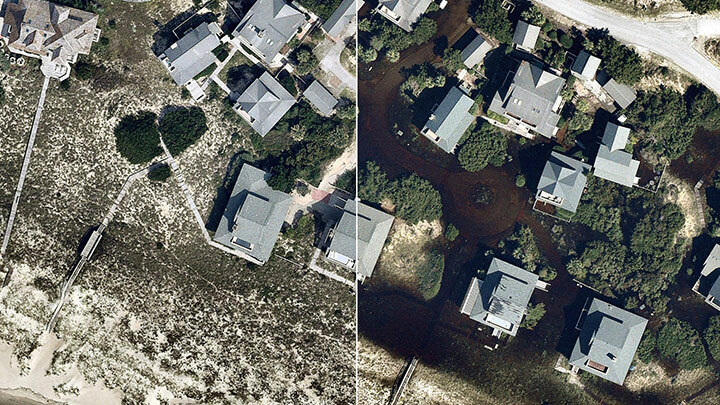 All the Nearmap pre- and post-hurricane imagery is published at sub-3-inch ground sampling distance, which allows users to see great detail on the ground. At this resolution, they can clearly identify important ground conditions such as roof blow-off, property damage and flooding. The same is true for streets and all other ground features, providing details for users to complete analysis both pre and post storms.